A long time ago I read an article about Frank White that had some information that has stuck with me. White described a time in his playing career when the stress of holding down a major league job began to overwhelm him. He was unable, during down time away from the park, to focus on any one thing. Instead, he would have a magazine open and the TV on and the radio blaring and a record spinning on the turntable, his attention like a hummingbird trapped in an electronics store, flitting from one barren babbling source to the next, never landing anywhere, instead only becoming more and more exhausted. I may be remembering the article incorrectly, but I think Frank White saw that earlier way of living as a time when he was bordering on mental illness. Unfortunately, I can’t recall how he pulled himself out of that habit, or even be a hundred percent sure that he was recalling the everything-all-at-once episodes from a remove or rather still trying to find a way out of them. 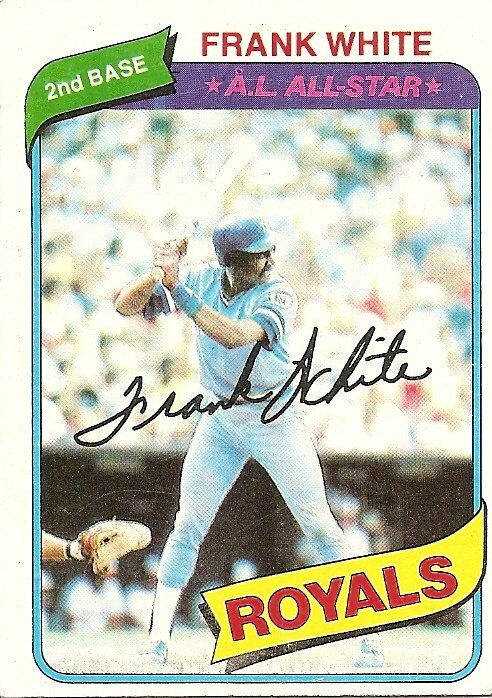 All I know for sure is that Frank White was, as this 1980 baseball card reports, an All-Star. In my mind he was as constant a presence in that annual game as anyone from his era, and since he was not a magnetic superstar such as Pete Rose or Reggie Jackson there was something even more solid about his presence in the midsummer classic than other more well-known perennial all-stars. Superstars weren’t always super, year-in and year-out, instead rising and falling and rising in magnitude and magnificence, but Frank White was always Frank White, kind of in the background, no national commercial endorsements or magazine cover spreads, a constant presence in the exalted exhibition, his prominence or role never changing. I think the reason I still remember that article that described the way he unraveled into a powerless mess at the mercy of his in-home sources of entertainment is because I am still a little disturbed that the solidity of Frank White was a mirage. Everyone, even Frank White, is clinging to the ledge by their fingernails. You are currently browsing the archives for the Frank White category.